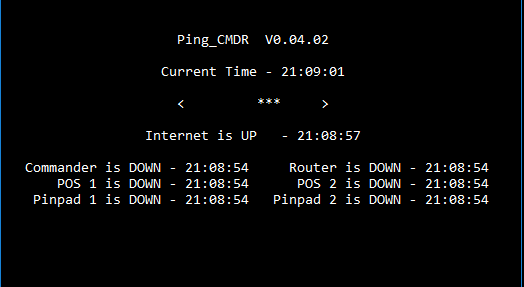 Ping_CMDR is a software tool for use with the Commander POS system. It can be used to help troubleshoot the network for the equipment. Each device on the network will show the time the status last changed. 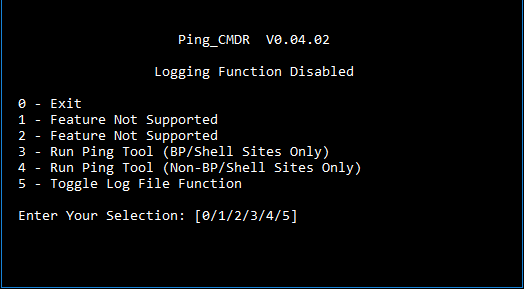 Ping_CMDR v0_04 is the latest stable version. David Ray Electronics and More (DREAM) and Ping_CMDR is not affiliated with Verifone and all software is original. Please use at your own risk. David Ray Electronics and More offers no warranty on its use. 0 – Exits the tool. 3 – Runs the tool for BP/Shell sites. These sites do not have the pinpads connected to the POS network and instead the pinpads are connected to a supplemental network. 4 – Runs the tool for non-BP/Shell sites. This will also check connectivity for pinpads. 5 – Toggles the log file function. When enabled the software will keep a log for when each device goes online or offline. This can be used for troubleshooting. Here is the main user interface. You can see there are listings for two different POS terminals and two pinpads, along with the router and the Commander. The time next to each device will show the time the status for each device changed. Please EMail Contact@DREAM-Enterprise.com with any questions or feedback. Thank you.